It's the season when the skies are the clearest, the temperatures are the coolest, and the tourist numbers are at the lowest – meaning it's an excellent time to visit! Many people don't realize that the majority of the US national parks remain open throughout the winter months; very few of them close, even when they get hit with snow and ice. 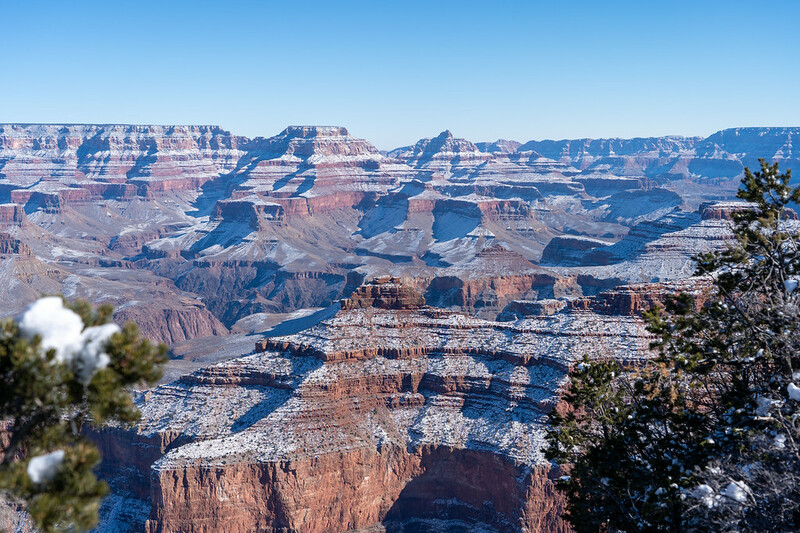 And I think that winter might be my favorite time to visit the popular parks like the Grand Canyon. This means there are more chances to take your time and truly appreciate the awesome power of Mother Nature that's on display if you visit in the winter. Across the plaza from the visitor center, you'll also find the main park store. In 2019, look out for cool centennial clothing and souvenirs, as the Grand Canyon is celebrating 100 years as a national park this year! You'll also find Bright Angel Bike Rentals in this main plaza. You might not want to rent a bike or go on a bike tour if it's cold or snowy out, but you can stop in to the shop's cafe for a coffee or hot chocolate – they have the best coffee at the Grand Canyon! Next up, it's time to actually see the canyon! You can walk to Mather Point from the main visitor center in about 5 minutes, so I recommend starting there. Afterwards, you can hop on a park shuttle to see more of the canyon. I recommend the shuttle option simply because it beats driving in the snow*. Shuttles run at least every 30 minutes, but sometimes come more often if it's a busier day at the canyon. Once you get back to the Visitor Center, you could swap over to the Blue Route, which will take you into Grand Canyon Village. OR you could hop back into your own vehicle to drive out to some of the viewpoints that the shuttles don't service in the winter. *Note: You don't HAVE to take the shuttles in the winter. As long as the roads are open, you are welcome to self-drive in the snow, and can visit most of the spots on the Orange and Blue routes with your own vehicle. But if you're not used to winter driving, I do NOT recommend driving in the park if there's snow on the roads. You have two options when it comes to self-driving at the South Rim. 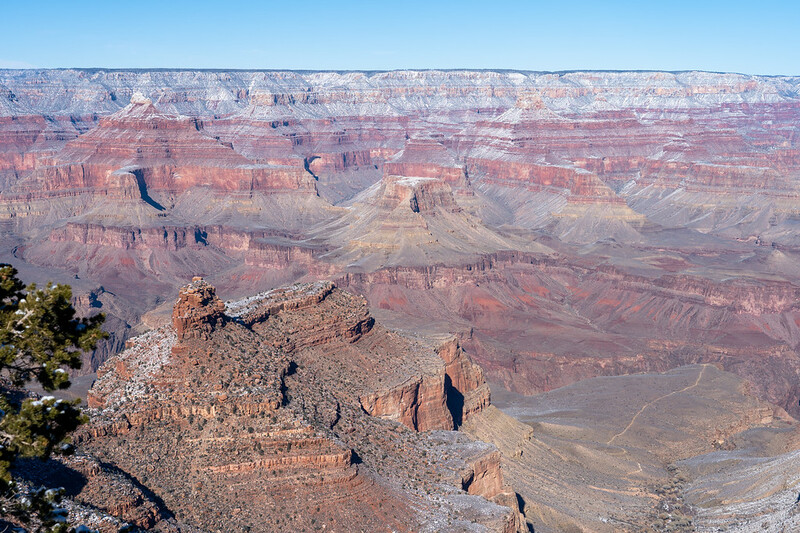 You can head east towards Desert View and the Grand Canyon's East Entrance, or west through Grand Canyon Village and out towards Hermit's Rest. 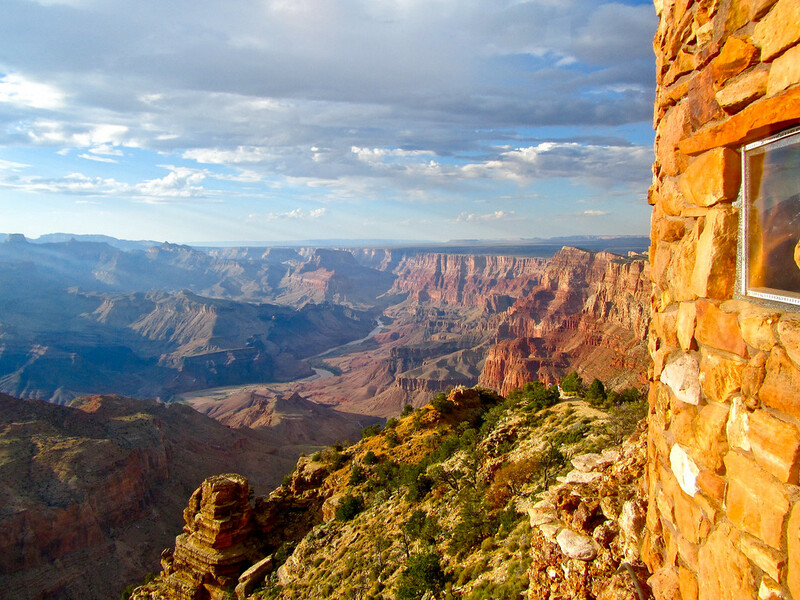 If you go east, you'll see some of the viewpoints you can access by shuttle like Yaki Point. Other viewpoints I really like along this route include Grandview Point and Moran Point. And you'll reach Desert View at the end, where you can climb 85 steps to the top of the Desert View Watchtower for fantastic views out over the canyon. If you go east, go through Grand Canyon Village and onto the Hermit's Rest road. During the summer months, private vehicles aren't allowed on this road, and the viewpoints can only be accessed by park shuttle. But it's the opposite in the winter. All the viewpoints on the way to Hermit's Rest are excellent, including Maricopa Point, Hopi Point, Mohave Point, The Abyss, and Pima Point. The easiest hike is to do a section of the Rim Trail, which stretches more than 12 miles from Hermit's Rest all the way to the South Kaibab Trailhead. Pick a viewpoint to start at, and start walking; the trail follows the canyon edge and is relatively flat. 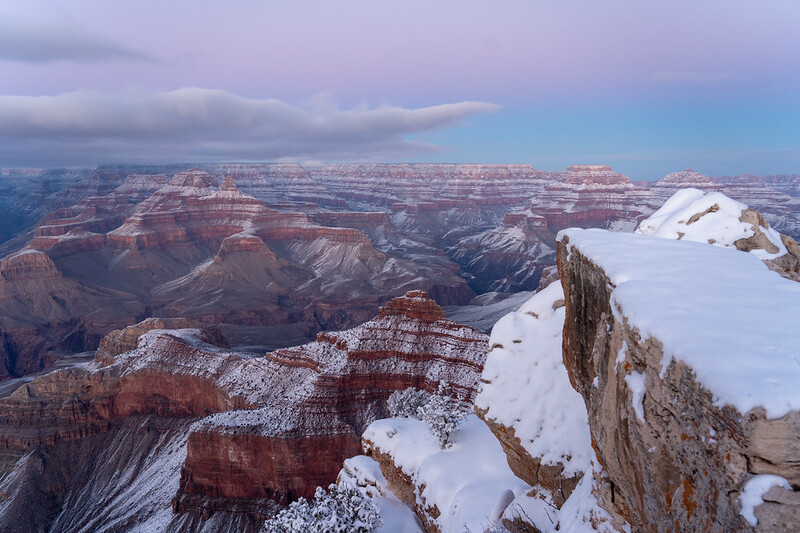 *The reason I don't recommend any tougher/longer is because the Grand Canyon trails are not shoveled or salted or anything during the winter, meaning they can get snowy and very icy. I would not recommend any long hikes to anyone who isn't a seasoned cold-weather hiker, as it can be very dangerous this time of year. 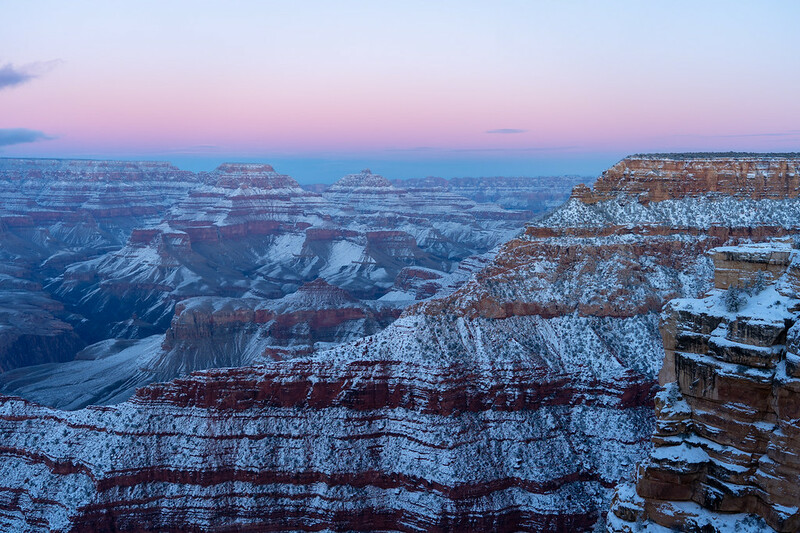 Lastly, you'll definitely want to catch a winter sunset at the Grand Canyon. Days are shorter during this season, so you can easily catch the sunset and then go have dinner. On my most recent Grand Canyon trip, I watched the sun set at Mather Point. This is the most popular sunset spot simply because it's close to the visitor center and parking lots – but it also has a great view! Sunrise/sunset times: In December, the sun is rising around 7:30 a.m. and setting between 5:10 and 5:25 p.m.; in January, the sun rises between 7:30 and 7:40 a.m. and sets between 5:30 and 6 p.m.; by February, you're looking at sunrise time between 7 and 7:30 a.m., and sunset between 6 and 6:20 p.m.
First things first: I recommend staying as close to the Grand Canyon as possible for your winter visit. That way, if you run into snow or ice, your plans won't be affected quite as much. 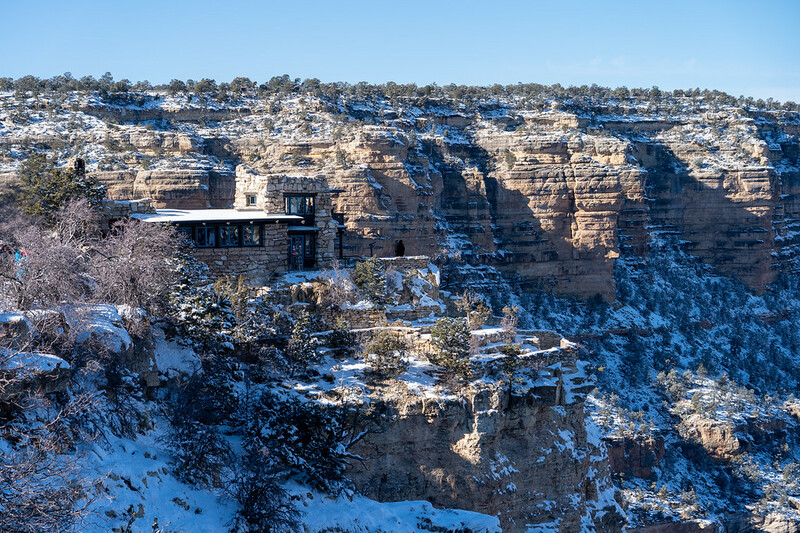 Staying at one of the Grand Canyon's historic South Rim lodges is nearly impossible during the busy summer season unless you book months (sometimes up to a year!) in advance. 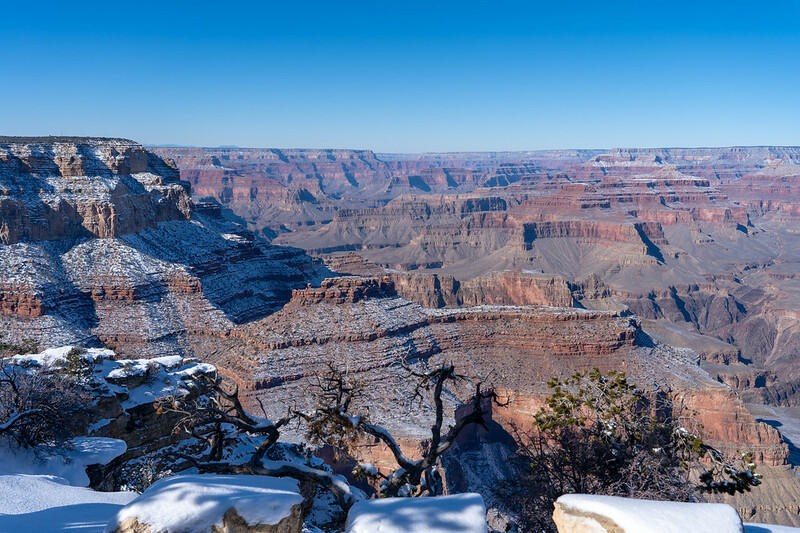 But if you're visiting in the winter (and especially if you're visiting on a weekday and not during a school break), you can often find open rooms at the Grand Canyon – sometimes even at the last minute. – The most elegant of the bunch, and generally regarded as one of the best historic National Park lodges. 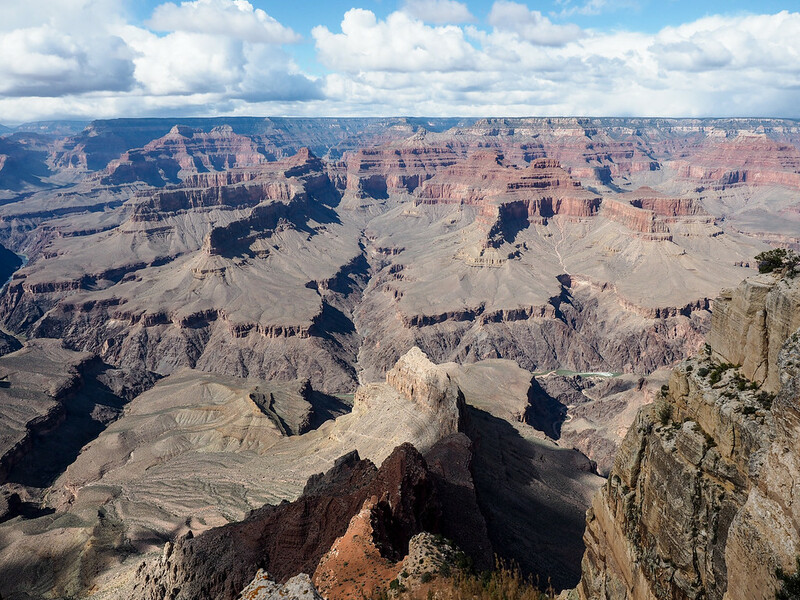 – Iconic and rustic and right on the South Rim. – A slightly more contemporary lodge within the park. – Centrally located in Grand Canyon Village. – Also located in the heart of Grand Canyon Village. – Located in a more wooded area and home to the popular Maswik Food Court. If you don't really care whether you stay IN the national park or not, I recommend staying in Tusayan, Arizona. This little town is only a couple of miles from the South Entrance of Grand Canyon National Park; you can easily reach the Visitor Center in 15-20 minutes in good weather, but the hotels are often far more affordable. I stayed at the in Tusayan on New Year's Day and paid $160 for a large double queen room. And that's during one of the busiest weeks of the winter season! Another option is to stay in the town of Williams, Arizona, which is about an hour away from the Grand Canyon. If you're interested in taking the to/from the canyon, it runs from Williams. . 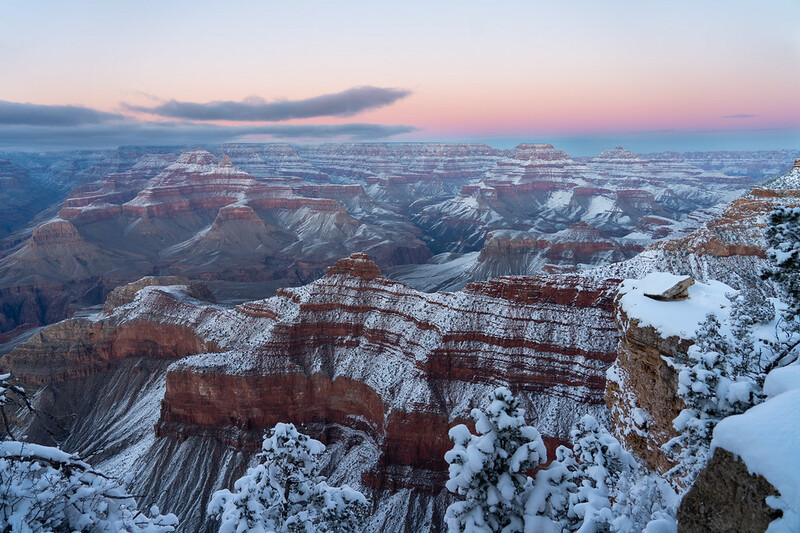 I can't stress this enough, guys: the Grand Canyon gets COLD in the winter. The canyon sits 7000+ feet above sea level, meaning it's much colder on the South Rim than lower-elevation spots in northern Arizona. On the 2 days I was there, it was 9 degrees Fahrenheit one evening, and only about 20 degrees F the following day. Warm layers – I'm talking at least a base layer under your normal clothes and a warm outer layer on the coldest days. 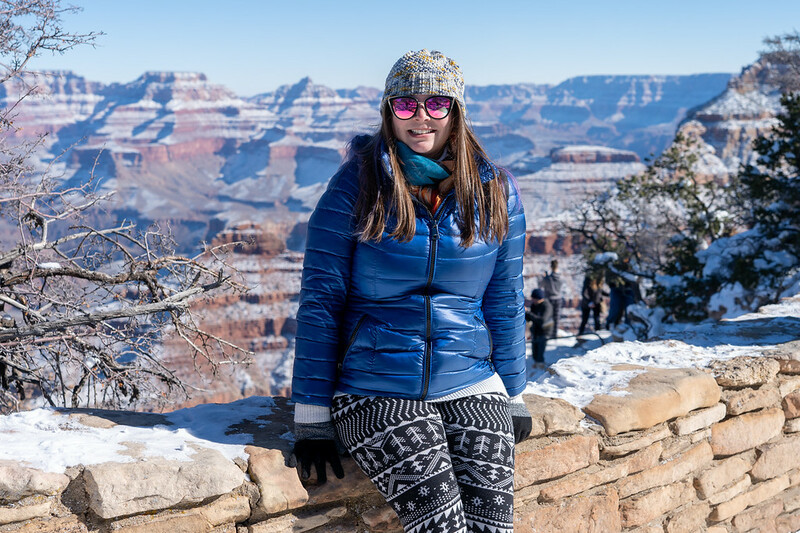 When I went to the Grand Canyon in January, I wore a and under a sweater and thicker leggings, and then wore a down coat on top. Ice crampons – I wore my , which are great boots but not necessarily *winter* boots. As I was slipping along the trail to Mather Point, I was wishing I had brought my with me, which fit over shoes/boots and act as mini ice crampons. 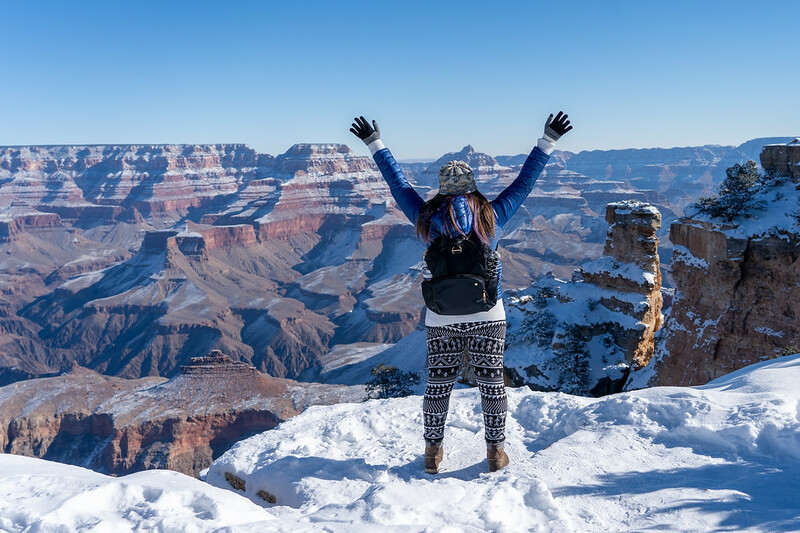 Hiking poles – If you're going to do any winter hiking at the Grand Canyon, you might also want to bring some along with good boots and Yaktrax. Most come with tips that are perfect for snow/ice. 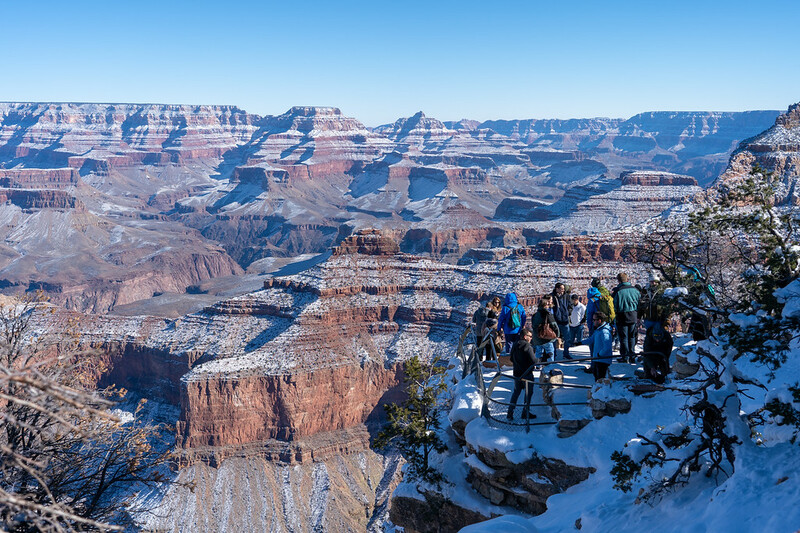 Sun protection – This one may seem strange, but winter is actually a very sunny season at the Grand Canyon! And because you're up at a higher elevation, you're more likely to burn faster. Be sure to pack sunglasses and sunscreen! 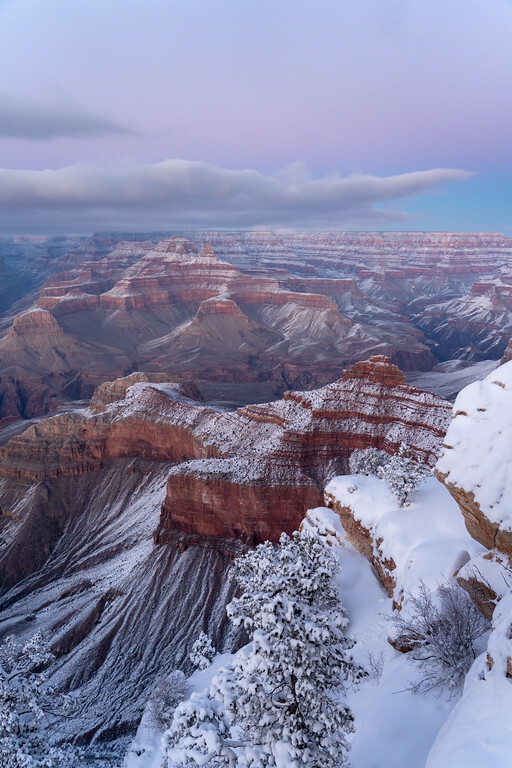 Oh my gosh – how beautiful are the canyons when they are covered with snow?! The colours are amazing! The snow really makes the colors and contrasts stand out more – it’s so beautiful! My husband, kids and I drove to the Grand Canyon on a grand road trip from the East Coast for Spring Break (early April) a few years back. We arrived on a gorgeous, sunny, blue sky day with a fairly decent size crowd.. Imagine our surprise when we woke to a snow storm the next morning. Our kids wanted to stay inside at the hotel but we made them go out to see the Canyon – and I swear we were the only people there! We used the shuttle bus to go to various viewpoints and the snow made for some amazing photos – just like yours – and we had hot cocoa as the only visitors at one of the stops. One of my favorite travel memories! That sounds amazing! Snow storms at the Grand Canyon are definitely special! 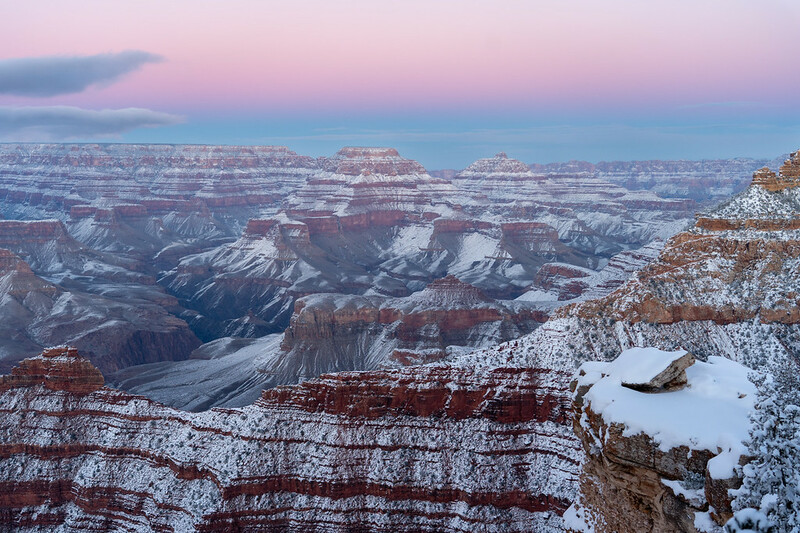 I’ve seen snowy photos of the Grand Canyon before and thought they were so beautiful. I’ve never been in any season, but as a snow lover I think winter would be the perfect time for me to visit! If you don’t mind the cold, then I’d highly recommend going in winter! Even if you don’t get snow, you’ll experience less crowds, which is always a ! ‘Nice one Akatuki. In fact we did! I’ve only been to America once and it was in winter! We were in the US for almost a month from January to February! Our son was 9 years old then, so we had to get extra permission from his international school so that we could extend the winter school holiday from 1 week to 3.5! 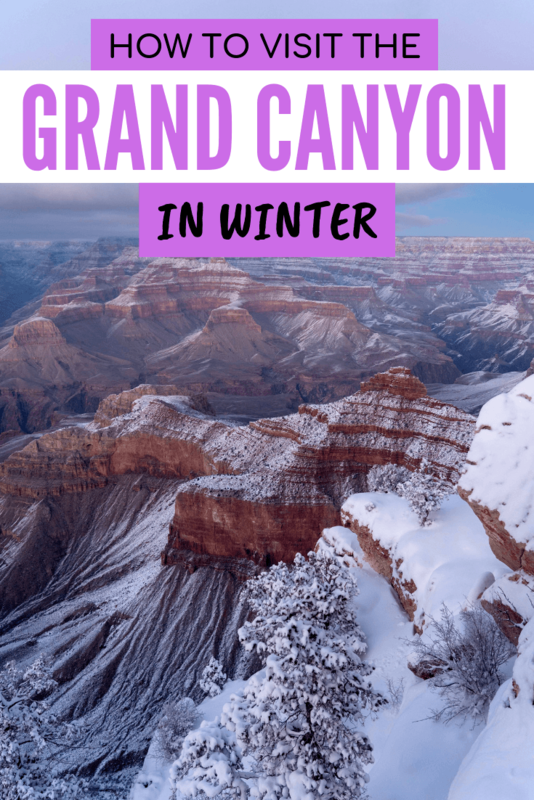 We went to the Grand Canyon where there was snow everywhere and we absolutely loved it. One of the rangers even took our son for a mini-hike, cos he was the only child around! We stayed at the Best Western Premier Grand Canyon Squire Inn too and it was so funny having bacon that wasn’t like our bacon, and scones that weren’t scones at all! I’m British by the way! 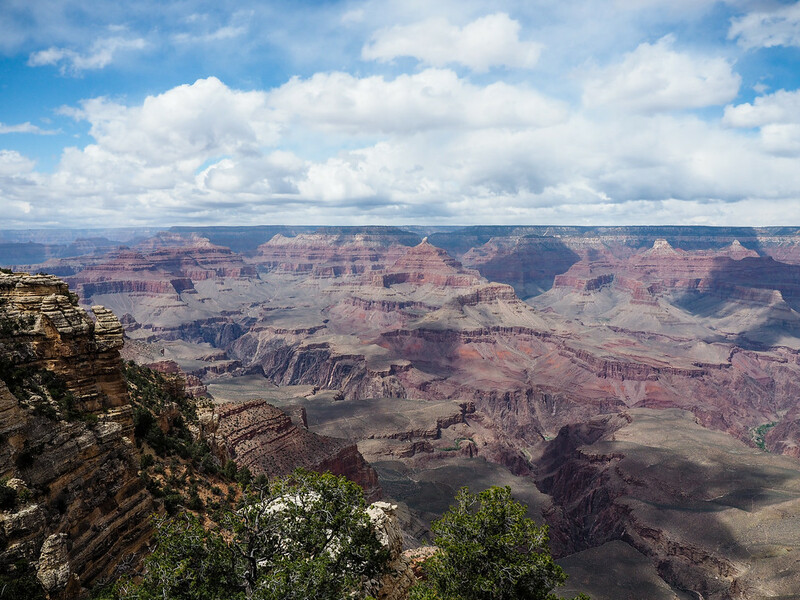 Not only did we go to the Grand Canyon, but altogether we visited four National Parks in California, Arizona, Uta and Nevada. Sounds like it was a great trip! 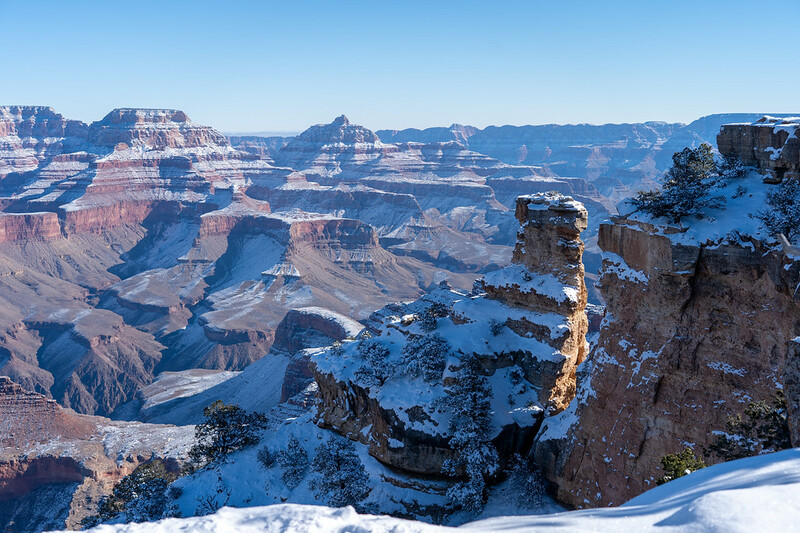 The Grand Canyon in the snow really is something else. I don’t think I’ll ever forget that sunset! These photos are amazing. OMG. The Grand Canyon is so high on my bucket list and yet it never seems to work out. Have you ever gone alone? Thinking of going alone and signing up for a tour, but very intimidated by that. I have not gone alone, but there’s no reason why you couldn’t! It’s a beautiful place, and totally safe as a solo traveler! Great write up! I do have a question about getting to/from Grand Canyon. Next week, the day we are set to leave and head back towards Albuquerque, snow is expected. Will that impact going back through Flagstaff with road conditions? Don’t know if I40 is affected by that or not. It definitely could impact your drive, as the Flagstaff area does get snow! I would just be sure to check weather and traffic reports on the day (but Flagstaff is used to snow, so usually they do take care of the roads). I never knew you could really visit there in winter. And yest there will be least tourist in that time, and the view is much different yet beautiful as seen in pictures above. Thank you Akatuki for this beautiful post. This is a great article! We are visiting the Grand Canyon for spring break this year along with several other Parks in Utah and can’t wait to get out and explore. I completely agree with visiting the Parks in the “off season” and we hope that even through it’s spring break, the crowds will be smaller. I love your sunset photos and am hoping to get several of those myself. Such pretty reds, oranges, and pinks, and the dusting of snow makes them even more interesting. We are also staying at the Best Western, so thanks for the tips! Hope you have a great trip! I visited over New Year’s (which is the busiest winter week) and didn’t find it too crowded. Hopefully it’ll be similar over spring break! 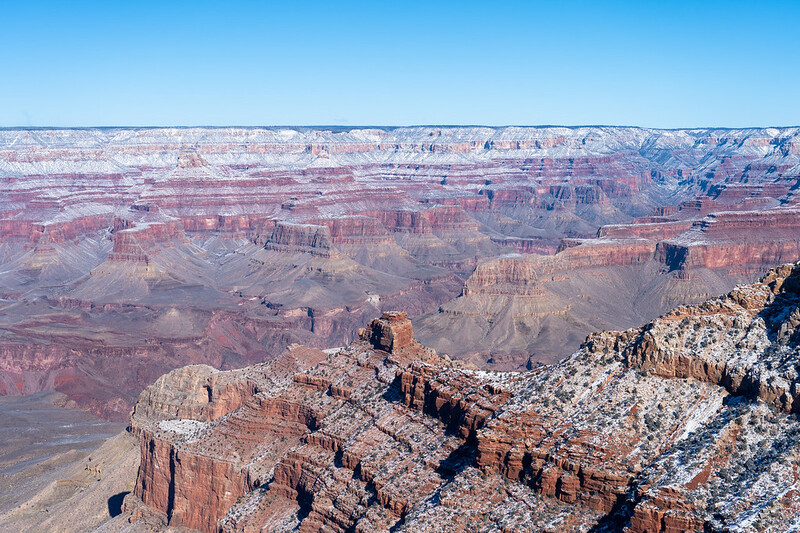 We visited Grand Canyon National Park in the late winter and enjoyed our hike to Ooh-Aah Point. The trail was icy so the microspikes came in really handy. However, the views were incredible, and we loved the fact that the park wasn’t crowded. We coupled the trip with a visit to Sedona and loved every minute! It’s a great spot to visit in the winter! But yes, you have to be prepared for that ice!